The 2012 Vail Film Festival was being held March 29th through April 1st. Mr. LH had passes to the festival for all four of us so thankfully, those dates fell right at the tail end of the "Pickles" Spring Break. Last year, we were only able to spend part of a day in Vail, but we packed in the activities and site-seeing. This year, we had two full days and one partial day to load up and we did pretty well. There is no way I can share all the photos and video we took (The first day alone included over 300 photos and 25 videos) but I can certainly attempt to share a lot! and decided to take the round-about way through Clear Creek Canyon on Hwy 6 to I-70. It's a bit slower and very curvy compared to just taking the highway, but the road is much much flatter and the rocky scenery never disappoints. Hwy 6 runs into I-70 just east of Idaho Springs. From there, it's less than an hour to our customary rest stop in Georgetown for complimentary hot cocoa and coffee at the Visitor's Center. We didn't stay in Georgetown long this time. We had gotten a late start that day and were in a hurry to get to Vail. About 15 minutes further up the interstate put us west of the continental divide and barreling down the mountainside toward Silverthorne and Frisco. I feel I need to mention that we've taken several trips into the Rockies (never beyond Vail) and the mountains are always so impressive to me. I hope I never become immune to their beauty. Even on the drive in, we noticed quickly how little snow there was this year as compared to last year. 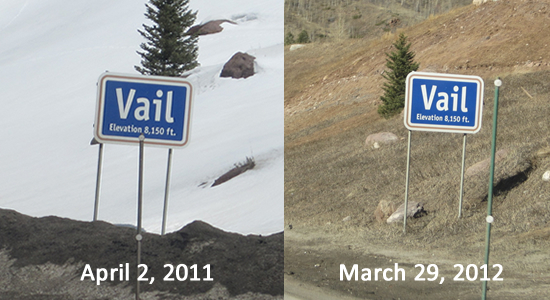 Vail boasted an 80" base at this time last year and was able to extend ski season. This year they had a 30" base (dropping several inches a day), limited skiing hours and still had another week to go before the official ski season ended. Once at our hotel, the first thing the "Pickles" did was check out the cable listings. Since we have no cable tv at home, it's one of the "luxuries" for them on trips. We didn't plan for them to be in the room long enough to watch much television, and we immediately headed out to Vail Village. Since it was after 3pm (free parking after 3pm), we parked in our usual parking deck in Lionshead and found a Volvo on display made completely of Legos! Then we took the Intown bus through town to Vail Village and Solaris Ice Rink where we managed to find the Will Call booth to pick up our passes. ...and since The Boy's empty stomach was starting to affect his mood, we got a couple gyros from a street vendor (Nicky's Quickie) to tide us over until the Vail Film Festival's opening night party that night. The "Pickles" really enjoyed eating their gyros on the banks of Gore Creek. We still had another hour to kill before the opening night party started and the sun was starting to drop (along with the temperature). We kept warm by a gas fire pit located by the creek. The Boy had been looking forward to the party simply because he knew there would be food there. He doesn't care for social events but he cares a LOT about food. As skinny as he is, he has a very large appetite. I think all the food he eats goes into making his legs longer. Pop Artist Michael Perez was also at the party creating a painting to be auctioned off at the closing night party. We made sure to take advantage of the "photo op" wall before we left. It was ten o'clock before we all headed out into the chilly air to make our way back to the hotel.